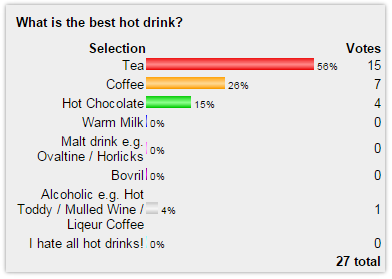 Firstly, thanks to everyone that took part in #HOTDRINKDAY on Sunday, regardless of whether you supported tea or coffee, it's much appreciated, it was great fun to do and I hope to take part in more debates of equal seriousness in the future. Fingers crossed I'll be back in a day or two - with a working computer! I look forward to the next debate!